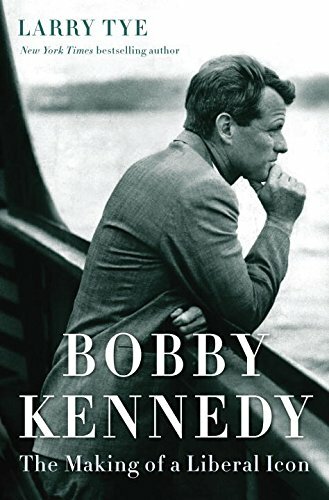 An in-depth biography of Bobby Kennedy. Larry Tye has done his homework...The story he tells in Bobby Kennedy: The Making of a Liberal Icon is familiar, but the vast array of materials he has consulted and the interviews he has conducted are enough to give it a new vitality ... We are in Larry Tye’s debt for bringing back to life the young presidential candidate who spoke these words and, for a brief moment, almost half a century ago, instilled hope for the future in angry, fearful Americans. ...eases out the complex truth behind the simplistic image of a liberal warrior, and offers up a compelling story of how idealism can be cultivated and liberalism learned ... Tye’s work feels most essential when seen as a mirror of our own times, reflecting back the scant progress our country has made on the issues Kennedy fought hardest for near the end of his life and the cynicism that has so deeply permeated our culture ... Tye does an exemplary job. ...an evocative in-depth portrait of the most complicated Kennedy ... Mr. Tye’s account of Kennedy’s early career is insightful, nuanced, fair and balanced ... Deeply sympathetic to Kennedy for making forgotten and neglected Americans his primary constituents, Mr. Tye chooses to end his biography with a moving — and myth-making — tribute to Robert Kennedy, the person. What did you think of Bobby Kennedy: The Making of a Liberal Icon?